Institutions can respond to Blacks and Whites differently. Institutional behavior can injure Blacks, and when it does, it is racist in outcome, if not in intent. Racism is both overt and covert, and it takes three closely related forms: individual, institutional, and systemic. Individual racism consists of overt acts by individuals that cause death, injury, destruction of property, or denial of services or opportunity. Institutional racism is more subtle but no less destructive. Institutional racism involves polices, practices, and procedures of institutions that have a disproportionately negative effect on racial minorities’ access to and quality of goods, services, and opportunities. Systemic racism is the basis of individual and institutional racism; it is the value system that is embedded in a society that supports and allows discrimination. Institutional and systemic racism establishes separate and independent barriers to access and quality of health care. Institutional racism does not have to result from human agency or intention. Thus, racial discrimination can occur in institutions even when the institution does not intend to make distinctions on the basis of race. In fact, institutional discrimination can occur without any awareness that it is happening..16 Although data on institutional racism iis scarce, it does exist. To understand institutional racism, it is important to understand the interaction between prejudice and discrimination. Prejudice is an attitude that is based on limited information or stereotypes. While prejudice is usually negative, it can also be positive. Both positive and negative prejudices are damaging because they deny the individuality of the person. No one is completely free of prejudices, although they may not have any significant prejudice against a particular group. Oppression is the systematic subjugation of a social group by another social group with access to social power. Power is the ability to control access to resources, the ability to influence others, and access to decision makers. Discrimination is behavior, intentional or not, which negatively treats a person or a group of people based on their racial origins. In the context of racism, power is a necessary precondition for discrimination. Racism depends on the ability to give or withhold social benefits, facilities, services, opportunities etc., from someone who is entitled to them, and is denied on the basis of race, color or national origin. The source of power can be formal or informal, legal or illegal, and is not limited to traditional concepts of power. Intent is irrelevant; the focus is on the result of the behavior. 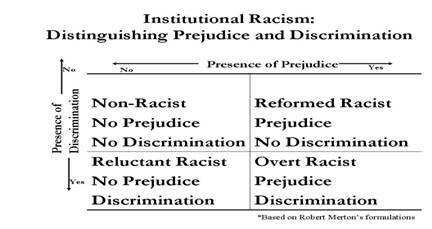 Given the interaction of prejudice and discrimination, an institution can be a “non-racist”, “reformed racist”, “reluctant racist”, and “overt racist.” (Chart 01) Using Blacks as the focal group, a “non-racist” is an institution that has no negative biases or prejudices against Blacks and no discriminatory behaviors. It is very rare that an institution has neither racial bias nor prejudices and engages in no discriminatory behavior. When institutions take the position that they are non-racist, it is possible that the institutions operate in arenas where they have very little contact with Blacks. However, it is more likely that they are in denial about the existence of either prejudices or discrimination. A “reformed racist” institution has definite biases or prejudices against Blacks but does not act on them. For example, an institution could hold a belief that Blacks are more likely to abuse pain medication, but notwithstanding those prejudices, pain medications are prescribed to Blacks equitably. In this situation, the institution makes no difference in health care based on race. This form of racism involves institutions that harbor biases or prejudices but are either too timid to discriminate or who are actively working on not discriminating. The prejudices or biases are still present, but these institutions do not act on them. An “overt racist” institution has definite bias or prejudice and definite discriminatory behaviors. For example, individuals in an institution could hold a belief that Blacks are more likely to abuse pain medication, and because of those prejudices, pain medications are prescribed to Blacks differently than they would be to Whites. Most people are familiar with this form of racism. Overt racism involves actively and intentionally expressing bias or prejudice and actively discriminating against others in public and private ways. Most discrimination in health care is not overt. Once an institution becomes aware of the discriminatory impact of its policies and practices and yet fails to change the policies and practices, then the institution is no longer a “reluctant racist” but an “overt racist”. 13United States Commission on Civil Rights, The Health Care Challenge: Acknowledging Inequity, Confronting Discrimination, and Ensuring Equality, Volume I, the Role of Governmental and Private Health Care Programs and Initiatives, 287 No. 902-00062-2 (September 1999). 15Douglas, How Institutions Think 125-26 (1986). 16Richard T. Schaefer, Racial and Ethnic Groups 76-78 (2000); Kwame Ture & Charles Hamilton, Black Power: the Politics of Liberation (1992). 17Institute of Medicine, Unequal Treatment: Confronting Racial and Ethnic Inequities in Health Care, Brian D. Smedley, Y. Stith, & Alan R. Nelson, Editors, Committee on Understanding and Eliminating Racial and Ethnic Inequities in Health Care 9-12 (2003). 18 Ture & Hamilton, Black Power, supra note 16.